Just a quick post with a couple I’ve seen on my travels over the past week that I’d hope will be winning soon. I’m away to Cheltenham today for the unveiling of the weights for the handicaps, at which point I’ll be getting stuck into them in a big way! Plus I’ll report any titbits and whispers I pick up today later in the week too! 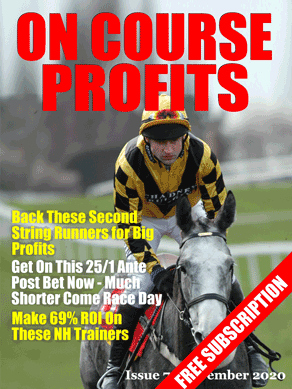 We have a bonus mail for you today with a race profile from Nick Hardman of the Betting School Insiders Club. Nick is renowned for his race profiling methods and the hundreds of points profit he makes each year using them. I have pasted the full write up on the website but here is the profile. The second installment of my Eyecatchers is now ready for you to peruse, I hope you find it of some use. Racing today isn't great, I'm afraid, but I do have a selection at Chepstow at the end of the piece that ought to be favourite, and isn't. I'll do a round up of the Eyecatchers tomorrow and which ones we should be looking out for in the next few days.